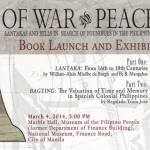 On 4 March 2014, Ligaya Amilbangsa, Nannette Matilac and Temay Padero with the participation of Ruby Varona performed at the Marble Hall of the Museum of the Filipino People, during the book launch of “OF WAR AND PEACE: Lantakas and Bells in Search of Foundries in the Philippines”. 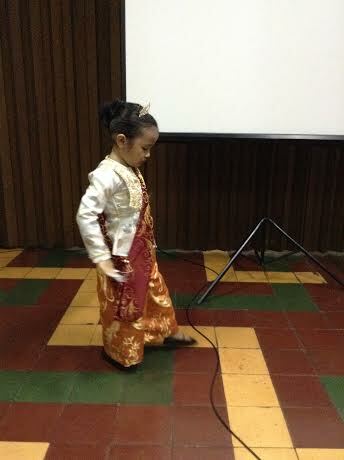 Dr. Abe Sakili played the pangalay beat as the ADC members danced. The members of the audience waved colourful paper flowers (handmade by Ligaya Amilbangsa) as part of the ritual. 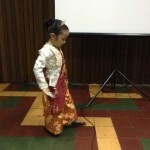 Ruby Varona performed the Sikado, a Philippine martial art followed by Igal Kabkab (fan dance), an original choreography by Ligaya Amilbangsa. 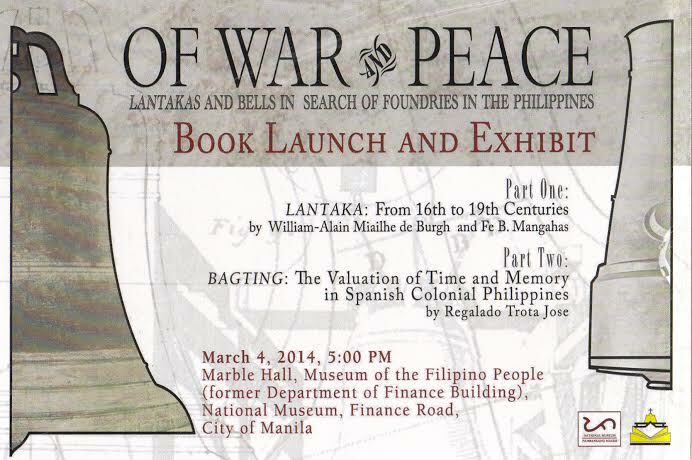 Earlier, on 24 and 26 February 2014, “Ang Pagbabalik sa Tawi-Tawi” was also shown at the UP Diliman. 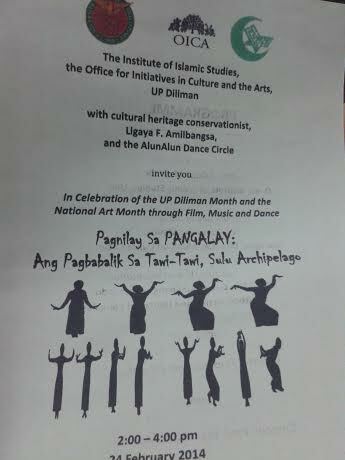 The UP Islamic Studies presented the film as a way to celebrate the National Arts Month of February 2014. 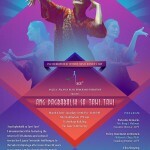 Pagbabalik sa Tawi-Tawi is co-produced by LotusBlaze Projects/DocuCinema Media Collective and ADC. 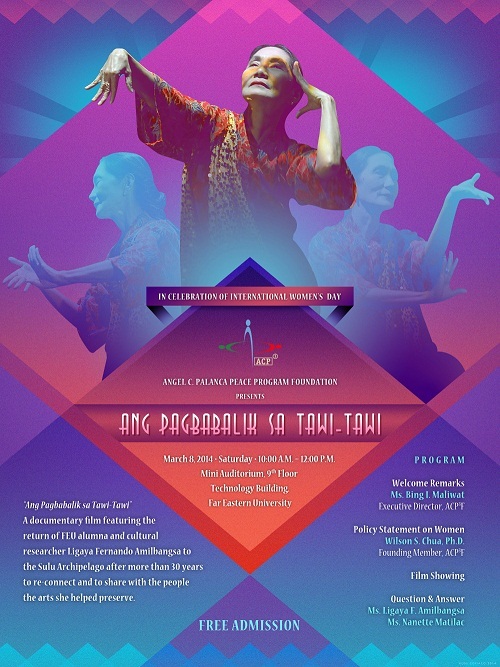 The UP Anthropology Department celebrated its centennial in Feb 2014 through pangalay dance and the exhibition of the documentary films “Sayaw sa Alon” and “Pagbabalik sa Tawi-Tawi”. The project is in cooperation with CSSP Folklore Studies Program. In between the film showings, pangalay workshops were conducted by Louanne May Calipayan. Our hosts apologized in advance for the scaled-down audience because Jan. 31, Chinese New Year, turned out to be a holiday. 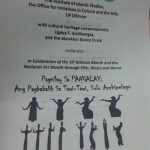 It was too late to change the date of the Cultural Night of the inaugural conference of the Philippine Association for the Study of Culture, History and Religion, as invitations had been issued way back in October 2013. Students who were expected to make up the audience had taken off for the three-day weekend, leaving the lovely Plaza San Jose of Holy Angel University in Angeles City sparsely filled. But to us, AlunAlun Dance Circle, our audience, big or small, deserved our best. Nannette, Temay, Gimo, Rama and I rehearsed our presentation and prepared for our trip with a sense of mission, but also of fun. It was after-all a balik-HAU for us, for we had performed in its state-of-the-art theater a few years ago in celebration of Arts Month. This time we were invited by one of the PASCHR convenors, Dr. Grace Odal Devora of UP Manila. The conference, she said, aimed to create a new network of academicians around the country and in the Asian region. Familiar with pangalay, she knew it would be a perfect fit for the conference theme: “Culture, History, Religion and Maritime Links Among the Islands of the Philippines and Beyond.” Fittingly too, the conference was co-sponsored by HAU’s Center for Kapampangan Studies. Although the Capampangan heartland is landlocked, the very name of the province bespeaks its beginnings on the shores (pampang) of the mighty Pampanga River. Our Artistic Director, Ligaya Amilbangsa, saw the relevance of pangalay to all this with her usual insight and enthusiasm. Indeed no dance could be more appropriate to demonstrate our pre-colonial culture flourishing in coastal settlements, than pangalay. Its undulating arm movements evoke the waves of the sea or fronds of seaweeds and palm trees, its flowing quality the sense of the ocean’s infinity, its mincing steps the limited space of the lepa or houseboat. The program we prepared aimed to “educate and entertain” by highlighting all these aspects which defined our indigenous identity and our close affinity with our Asian neighbors. Significantly, the conference posthumously honored the Pampango writer, diplomat, artist and bon vivant Emilio “(Abe”) Aguilar Cruz as “Prophetic Artist” for having foreseen way back in the 1970’s the coming-of-age of Southeast Asian identity. As has been our practice, we introduced our 15-minute presentation with “What is Pangalay?” showcasing the rich movement vocabulary of pangalay with all its finger, hand, and arm gestures, footwork, and body stances. Even as I was doing the annotation I observed that everyone was paying close attention to the demonstration. Warm applause burst out in the middle of the menfolk’s energetic and vivid rendition of fishermen diving and spearing catfish in “Tauti”. Nannette’s creative blocking of her solo number on the steps leading to the stage further increased rapport with the small but captivated audience. Aside from our own performance we had a chance to appreciate the song and dance numbers of the HAU Performing Arts Group coordinated by Raymond Petersen. True to Pampanguenos’ reputation as artists, the numbers were impressive in every aspect, from the elegant costumes to the colorful props. A memorable number was the dance featuring discrete parts of a Pampanga parol, which were assembled in striking visual arrangements at various points throughout the dance. The much-anticipated dinner was served at the Museo ning Angeles just across the street from the HAU campus. A homey vintage structure (1920) which used to be the town municipio, it has been restored and turned into a Culinarium to showcase the culinary culture which Pampanga is famous for. Windows thrown wide open brought in a cool breeze and showed the imposing Holy Rosary Parish Church festively lighted up against the night sky. But aside from the seductive spread of chicken asadong matua (marinated in calamansi and soy sauce, and simmered in onions and tomatoes), the dory with black beans and ginger, and double servings of refreshing pako salad, we were most thrilled to hear feedback on our performance. Upon being introduced to the ebullient conference keynote speaker, Dr. Amarjiva Lochan, President of the South and Southeast Asian Association for the Study of Culture and Religion based in India, we harkened to his comments expectantly. “When you started dancing, the audience immediately fell into a hush!” he recalled with amazement. He said he was mesmerized, delighting in the similarities he recognized with dances in certain regions of India. “You ought to do a three-month immersion there,” he said tantalizingly, and promised to link us up with the right people. He also encouraged us to create original water sounds (a swimming pool will do, he assured us) and record them ourselves instead of using ready-made ones from other cultures. Gratifying too, were the appreciative remarks of the conference chairman Dr. Esmeralda Sanchez of the UST Institute of Religion. After the usual picture-taking, and more picture-taking, we lingered in the congenial ambience before piling back into our vehicle. We had hardly entered the NLEX when everyone fell soundly asleep, our hearts full with satisfying cultural fare, confident that our well-received dance offering signaled a good year of dancing ahead.